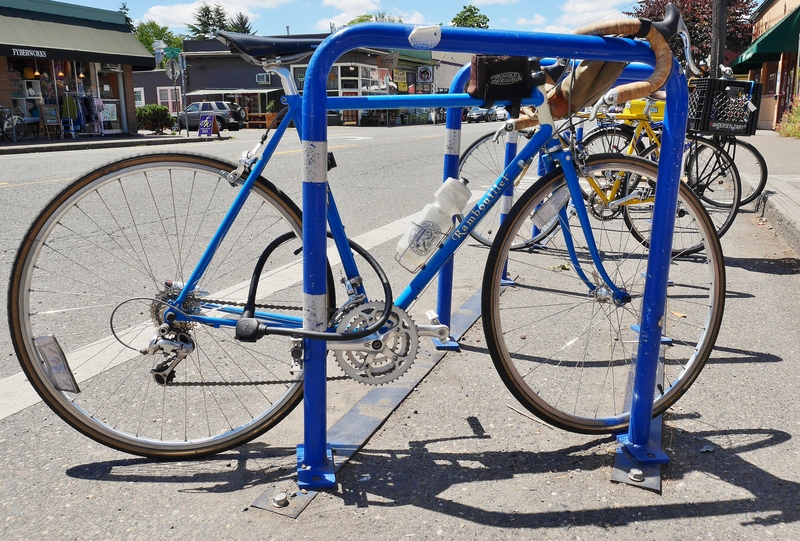 As I was having lunch at a neighborhood cafe, I saw a cyclist pull up on on a Rivendell and thoughtfully lock the frame up with a beefy cable. I don’t see these bikes in Portland all that often, but the first thing I noticed before I even realized what kind of bike he was riding was the Sugino X D triple crankset – a beloved component which, especially as manufactured in decades past, would seem to never wear out. I had one on my old Cannondale, and it definitely rivaled the performance of my 1984 Shimano 600 triple crank, which is still going strong and is now mounted on my Terry. I introduced myself to the bike’s owner, Roger, and asked permission to photograph his bicycle. We struck up a conversation and I learned that his Riv was a retirement gift to himself, fully spec’d by Rivendell, and purchased new back in 2004. This model is no longer available, but as you can see, he has taken great care of the bike, even though it has thousands upon thousand of miles on it. It was nice to visit with another “mature” rider who, though older than most cyclists in Pdx, clearly relishes each ride on his beloved machine, from centuries to week long tours to neighborhood jaunts. Grant Peterson has to be credited with the welcome shift in the cycling industry back toward the comfort of non-racing frame geometry and lugged steel construction. He also championed a return to bar end shifters, platform pedals, and “normal” cycling clothing. The Rambouillet was designed with a slightly (2 degrees) sloping top tube so that the stem position could end up a bit higher to provide a more comfortable ride. The original components appear to still be going strong. Probably the Ruffy Tuffy tires were replaced a few times over the last 12 years – but maybe not. Although I personally don’t care for the way they ride, I did use a set for a number of years and they never showed any wear at all. This Rambouillet is even equipped with Rivendell’s quirky hi-viz spoke mounted reflectors, and a Rivendell water bottle! 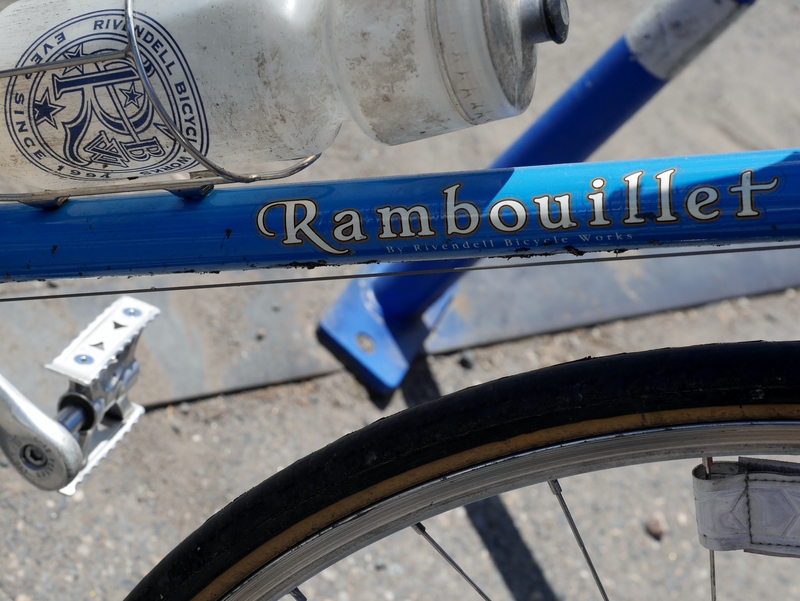 Sheldon Brown championed a number of Rivendell models, and counted the Rambouillet among his collection, which he first had set up as a fixed gear, but then later converted it to a 7 speed. Fortunately, Rivendell continues to fill an important niche in the cycling industry – riders who want a quality machine with reliable components, a bike that will last through the ages yet not bust the budget. This Rivendell gives evidence to the success of that mission. 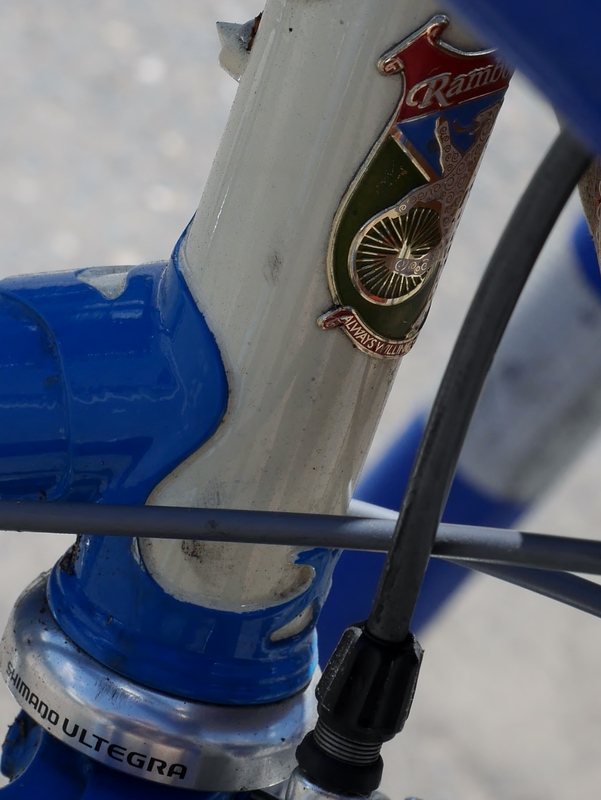 This entry was posted in bicycle frame geometry, Bicycle restoration, Vintage touring bicycle and tagged Rambouillet, Rivendell, Sugino XD by Nola Wilken. Bookmark the permalink. Cool! Did you stop down at Rivelo when Grant P was in town last weekend? I like the “windows” on the head tube lug. Does Rivendell still build frames? (I went t their website, but only found imports). I owned one. The orange color. Bought from Peter White when he still lived in MA (he moved to NH, and he still has an active website where he sells many bicycle parts not easily found in one shop). The TA (French) cranksets and chainrings are super high quality. If there was a provision for attaching pictures to this post I would have attached some of my bikes to include my 1956 Rudge-Whiteworth that I sold on eBay yesterday. I’ve owned bikes like Merlin Extralight (the engraved titanium frame, not the ones with decals) with DT wheeelset and Dura Ace components and customised recumbent, but to my mind nothing is as glorious as riding a well maintained vintage bicycle. I have a blue Rambouillet and live just blocks from where you took these pictures – so I guess they are not that rare in these parts. In 2004 or so they were sold at the bike shop down near Cinemagic (also on Hawthorne). I remember those days when Rivendell bicycles were available locally. I do occasionally see the Atlantis out in Pdx, which I believe was one of their best sellers.